The SlatePro TechDesk is a new Kickstarter project featuring a desk that has been designed with built-in docks and cutouts to accommodate several different Apple devices. It comes with multiple display docks that are able to hold an iPad, iPhone, or other mobile device, and air vents in the middle of the desk offer continual cooling for MacBooks. Designed to fit any size computer or laptop, from a MacBook to an iMac, the desk also comes equipped with a heavy duty mousepad, a filing rack, a pen dock, and a recessed cup holder. There are also built-in cutouts for cords to keep everything organized. The SlatePro's surface is cut from pure, premium bamboo and protected by a sheet of clear acrylic. It's super strong, very light weight, and it will support your computer with ease. The desk's steel legs are completely hand-crafted. They create the perfect height and are made by some of the best metal workers in the USA. Nathan Mummert, the SlatePro's creator, was also behind the Slate Mobile AirDesk, a successful Kickstarter project that featured a portable lap desk. Some early pricing tiers of the SlatePro have already sold out, but interested backers are still able to pre-order a desk for $448 on Kickstarter. The first desks are expected to ship in May of 2014, while orders made now will ship in June or July. While first acknowledging that aesthetic taste is an individual matter...for me that is an astoundingly unattractive piece of "furniture". That's horridly designed. I'll stick with my Ikea Galant thank you very much. 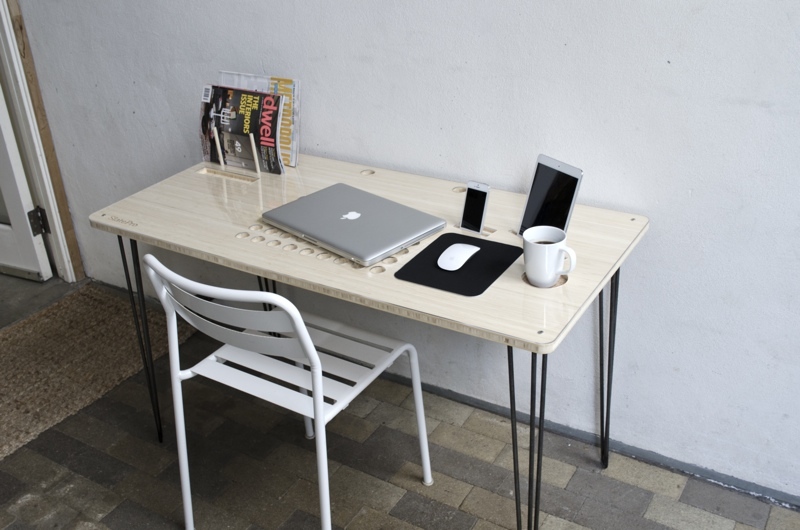 Its a nice idea, but there is so much variablily in what people require for the layout of their desk that can a non-bespoke product ever set up the right desk configuration built in? First of all, I also find it unattractive. Second, if you have an iMac you just have a bunch of ugly holes in the middle of your desk underneath your wireless keyboard to drop things into. Why do people think that "Handcrafted" standard parts are desirable? Handcrafting is only important if there is something unique about each unit that the crafter produces. The legs should be machine crafted to make sure they are as close to identical as possible. A handcrafted sculpture would be nice, but desk legs? Way to raise the price unnecessarily. Not too keen on the air vents as I can see random feet of my Macbook getting "stuck" in the holes. Cool to have built in docks but I like to move my mobile devices around. Those aren't docks. They are slots. Docks have connectors built in. Not cable slots. A dock allows you to dock something. A slot allows you to set something in it. My MBP doesn't seem to have air vents on the bottom of it..